Today, a question from Theory to Practice reader, Frank, regarding Autoregulating and drop-off. 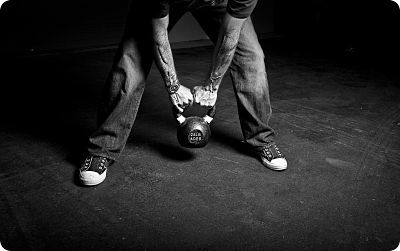 Keith, I have been enjoying your columns on Autoregulation and have been wracking my brain trying to apply it to my kettlebell workouts. I think it would involve managing intensities, work periods versus rest periods, instead of 5RM. Say my personal best with the 1 hand 50 lb KB swing is 100 swings (50 left and 50 right) in 5 minutes. Would an autoregulation progression involve getting that same work done in 4 or 4.5 minutes, or doing 110 swings in the same time period? Thank you for the blog posts. They are always appointment reading. Thanks for the kind words and the intelligent question, Frank. The short answer is this: both Autoregulation and Drop-off are methods by which to help manage fatigue, and “wave” intensities. Both methods are very close cousins, though not exactly the same animal. Autoregulation tends to work better for classic barbell/dumbbell work where we can correlate a load to a targeted rep range (i.e., singles to 15-ish reps), which is another way of saying managing “intensity” vs “volume”. Drop-off works better when we’re talking about measuring time or distance, i.e., where reps/load is not the “measuring stick”. Sprints are the prime example, here. Bodyweight exercises work well here, too. And it’s best to think of drop-off as a subset of the Autoregulation theme. One thing to remember as well: the term “Autoregulation” is much like the term “intensity” in that “context matters”. In other words, precise definitions that work both on the S&C floor and in the lab have yet to be completely nailed down. As I’m an “on the floor” vs an “in the lab” guy, I tend to skew toward the hands-on way. I’m not saying it’s right; rather, just that it is. Now, I know this is a bit confusing, because right away you’re probably thinking “what the hell, I just said 100 reps with 50 lbs in x amount of time.” Which leads to the second question you have to ask yourself: what course of action do you need to take to get *faster* at a given load. In this case, strength is (probably) a secondary issue (or at least one that’s the easiest to correct), with the primary issue (other than honing proper technique, of course) being metabolic conditioning. In fact, the training might look very much like the breakdown of training a track and field miler. Now, there is for sure a *crapton* (legit exercise physiology terminology, by the way 😉 ) that goes into training someone at this distance — way more than what I will dive into here. And let me say, too, that training for this distance is certainly not my forte, though I understand very well the concepts involved. That said though, let’s use this analogy to discuss employing the drop-off during a particular training workout. Ok, let’s say the day’s workout calls for x number of 200 meter sprints with a fixed recovery period of 2 minutes between sprints. Note (1): “fixed” recovery could be time or heart rate; i.e., as soon as the heart rate drops to x% of max heart rate. This is another discussion entirely, but it is yet another variable that can be accounted for in the drop-off method. So you can see that, depending upon what we find the athlete’s weak link to be, we can target a drop-off methodology to effectively target shoring that weak link. In the particular example above, though, what does “x” number of rounds correlate to? Well, I don’t know for sure going in, other than the close estimate I can gather from the trainee’s past workouts under similar conditions, and as a function of the stress the athlete is currently under. In other words, are we deep into a forced overreaching period, or is the athlete fairly fresh and ready to rock and roll? Let’s just say for the sake of argument that the target number of rounds is 6. And let’s say, too, that I’ve programmed this workout as a higher-intensity, mid-level volume work day. And let’s say that I’ve correlated approximately a 10% drop-off to accomplish that task. That 10% number is not fixed, but just what I’ve estimated for this athlete after having worked with him over time (this, btw, is where the art of coaching comes into play). This is also a function of the overriding theme of whatever particular block we may be in at the time; accumulation, transmutation or realization. Note (2): Again, the use of Autoregulation in the training of athletes does not mean the total abandonment of the block system. It is simply a tweak within the block system; a move away from hard-tracking fixed %-of-RM numbers. I still believe that a block system (albeit with an Autoreg tweak) works best for athletes who have the time and means to pull it off. While a free-style Autoreg method of “waving intensities and weaving modalities” works best for the “athlete as a hobby/2nd career” type. In other words, for guys like me. For more on that, see this post. So, the element of autoregulation here is establishing the day’s PR (in this case, on the 2nd sprint of the day – 23.7 secs). And it doesn’t matter if the day’s PR is set on the first sprint, or on the second to last effort. To the PR time, we’ll add 10% to that time (in this case, roughly 2.4 secs +23.7 secs = 26.1). We’ll pull the plug on the session as soon as we hit over 26.1 in one of the 200s. No matter is it’s after the 3rd sprint….or the 15th. This, then, is the drop-off component of fatigue management. Now, let’s use this idea in a KB context. You can tinker with load, “sprint” times and recovery in the same manner, attacking what you perceive your weak link to be. For instance, maybe we’ll construct a workout whereby we’ll perform 1 minute bursts with 70lbs for max reps, in the same kind of set up as above. Or, in a slight twist, maybe we’ll shoot for rounds of 30 swings, at 70lbs, for x time. We could then autoregulate that time, as above, via the drop-off method. Now the “art” here is going to be correlating what x amount of fatigue “feels like” in a recovery sense. In other words, what kind of recovery (length of time and modes) is involved in recuperating from a 10% hit in a particular modality? And note, too, that a 10% hit in one means (modality) does not necessarily nail the system like a 10% hit from another modality. Remember, we’re talking about a massively complex biological system here, and the whole reason we’re even talking about autoregulation and drop-off to begin with is because we acknowledge that attempting to “command and control” that system is, at best, blind hubris. Otherwise this would all be just a matter of plug-and-play. Because of it’s nature then, drop-off and fatigue percentages (and autoregulation in general) tend to drive left-brain dominant people crazy. The left brain wants hard, fast and absolute — not the mushy, mutable and directionally accurate. The left brain wants to control, not coax. It demands rather than nudges. But it’s my experience that “directionally accuracy” and “nudging” far exceeds “command and control” over the long haul. Right on, brother. Stew on this for a bit, then let me know if you have any questions. I know this can be a bit confusing.